My StumblePal RodneyHarrington is an action-taker par excellence: As his hard-hit Ohio town fights a rearguard action against the onslaught of foreclosures and dereliction, Rodney is organizing a grassroots counteroffensive in the most literal sense: Armed only with shovel, hoe and watering can, he’s transforming the untended, abandoned properties around him into food gardens, with the intention of giving away to his embattled neighbours the fresh produce they yield. Can there be a more apt embodiment of guerrilla gardening? I’m writing this in the hopes of getting my fellow Stumblers to “thicken the plot”, as it were. The Global Economic Crisis has made passive victimhood a new line of (un)employment. Taking action is an empowering experience, even if that action is inexpensive and low-effort. – Lend your mad artistic or sloganeering skillz to the theme of (Y)OUR GARDEN. Rodney’s hoping to get the neighbourhood kids involved, and bribery always greases the wheel for elbow greasing. As part of my care package, I’m going to make up some 1″ buttons to hand out to the little helper elves. For reference, the design should be clean and simple, appealing to kids, and fit on the face of a quarter. 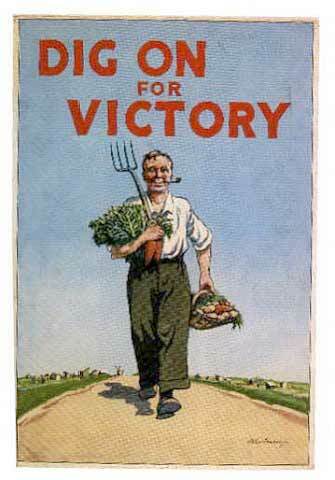 Feel free to lean heavily on the wonderful Victory Garden images from WWI and WWII. – Go forth and multiply (or propagate, to stick with a theme) this message. Tell your friends! Tell your Friends! Tell your network! Let’s see if StumbleUpon can green Warren, OH. Many, many thanks to BarryWeber for getting behind the idea and gathering a huge collection of seeds. Also thanks to his flock for the donations! Through Barry’s message, Rodney’s secured some involvement from local businesses, and has some support for starting his project. Woot! I can’t wait to see how it goes! This entry was posted in Gardening and tagged being-the-change, boat-rockers, Gardening, stumbly. Bookmark the permalink. Post a comment or leave a trackback: Trackback URL.